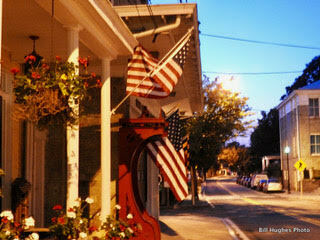 It’s one of my favorite, small Maryland towns – Port Deposit. It sits on the upper bank of the Susquehanna River between the Conowingo Dam and I-95. It lies in Cecil County. Picturesque Route 222, with an abundance of green foliage, runs right through the town of about 700 citizens. Another big plus for Port Deposit is that it’s only a short one hour hop north of Baltimore City, via Route 1. Port Deposit is steeped in history going back to the days when it was a center of shad and herring fisheries. Port Deposit is listed on the National Register of Historic Places. The Norfolk/Southern is one of the train lines that runs through it on a daily basis. Port Deposit has a number of really nice restaurants, too. One of my favorites is “Lee’s Landing.” I highly recommend its cream of crab soup. The restaurant is located right in the middle of the town and on the water side. If it’s a nice evening, like it was on this Labor Day (09.04.17), consider sitting in the back of the restaurant. There, you can enjoy, not only your meal, but also a view of a beautiful sun set, along with the ambiance of the Susquehanna and its river traffic. The other bridge that moves traffic on U.S. 40 is called the “Thomas J. Hatem Memorial Bridge.” Hatem was a popular Harford County politico who served in the General Assembly of Maryland with my former political mentor from South Baltimore, the late Harry J. “Soft Shoes” McGuirk. Port Deposit also has a lot of heart and that’s another reason I’m fond of it. From time to time, the Susquehanna overflows its banks, and the town takes a hard hit. But, guess what? The town folks roll up their sleeves, make the necessary repairs and get back into action. You go, Port Deposit! 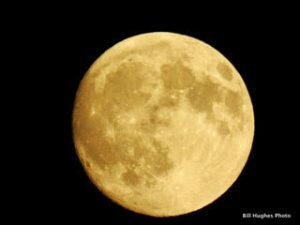 As we were leaving the town, the almost full harvest moon made its majestic appearance. You can’t have a better way of saying adieu than that. This leads me to another place I love to visit around this time of year – the Conowingo Dam. Earlier in the day, we made a stop at that site. It’s right on Rt. 1 and only a few miles from Port Deposit. 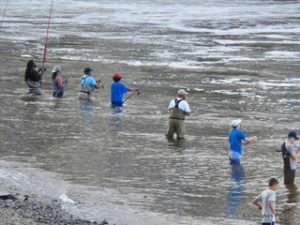 The bald eagle reigns here and it’s a fave spot for fishing, and if the water is still warm – to cool off in it. The dam supplies electricity primarily to the Philadelphia area. The reservoir formed by the dam, however, provides some of Baltimore City’s drinking water. 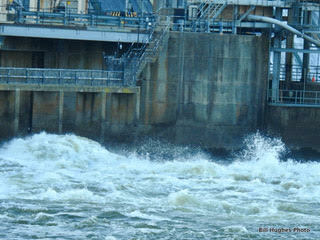 The dam currently has 53 flood control gates. The dam is situated about 10 miles from the mouth of the Chesapeake Bay and just five miles south of Maryland’s border with Pennsylvania. It’s at the town of Havre de Grace, down river, where the Susquehanna empties into the Bay. When you ride across the top of the dam, on Rt. 1, you can’t help but notice, there’s always a lot of engineering/construction work going on. The Conowingo Dam, built in 1928, is a work in progress. Its turbines are spinning 24/7 keeping up with the changing times and the growing demands of its customers. It plays an important part in the lives of so many. It’s easy to take the Conowingo Dam for granted, but, in this day and age, that would be a mistake.